I've worked very hard this year to really establish plants in the front garden. I love to sit with John and enjoy coffee on the weekends and the occasional late afternoon beer. We especially have enjoyed watching the hummingbirds. Currently, we have three that are regular visitors to the garden. One is convinced it is all his, and hides in a nearby tree guarding his territory. In the first picture, you can see (from left to right) rosemary & thyme, several different variations of lavendar, my new garden duck (thanks Mom! ), the strawberry planter / bird bath John gave me, holly in the back and the climbing rose bush in the back. This photo is taken from the front door looking out toward the street; the garden is walled in. 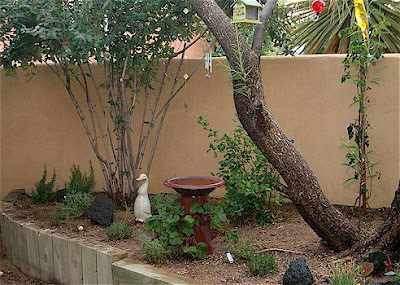 In the second photo, you can see a close-up of the garden's front corner. It's filled with large black lava rocks, which are found throughout New Mexico, and surrounded by stonecrop, desert roses, and cactuses. 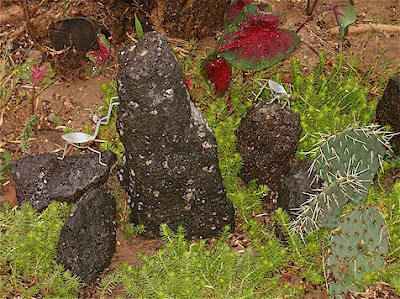 The metal bugs had been Jane's and continue to live in the garden. In the back you can see Caladiums just beginning to fill in. Finally, in the third picture, I'm standing back by the bird bath, looking back towards the front door. 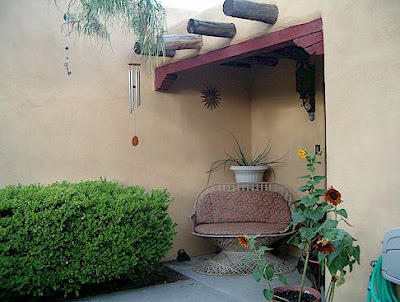 You can see my sunflowers in their pots, our little garden bench, and the wind chimes. At night during the thunderstorms, we sit out on this bench, mostly sheltered from the rain, and watch the storms. I look forward to this filling in more and more. People are always surprised by the garden when they come to the house. I'm pretty sure the pizza boy would like to live there. It has a very relaxing quality to it. We've enjoyed herbs from the garden, as well as many weekends drinking coffee and watching birds.